What graphics card do you have in your computer, and is it installed correctly? I assume you're not running XAP over RDP or within a virtual machine. Could you have a look in C:\ProgramData\XamarinAndroidPlayer and attach the AndroidPlayer2015xxxxxxxxxx_opengl.log and AndroidPlayer2015xxxxxxxxxx.log files from there? HI @MarkSimpson . Thanx for your reply . I have Intel HD graphics running on my machine. 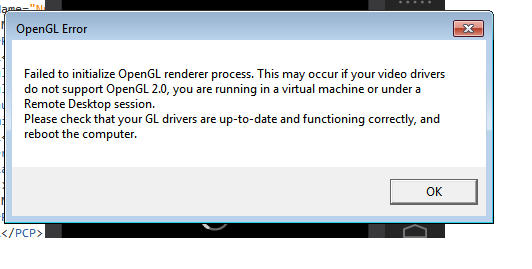 I just updated my system's(windows) Graphics driver and everything seems to be working fine now.